This book presents new guidelines for the control of cracking in massive reinforced and prestressed concrete structures. Understanding this behavior during construction allows engineers to ensure properties such as durability, reliability, and water- and air-tightness throughout a structure’s lifetime. 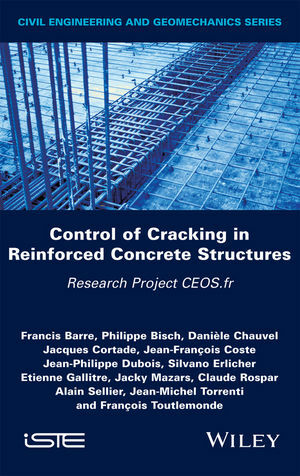 Based on the findings of the French national CEOS.fr project, the authors extend existing engineering standards and codes to advance the measurement and prediction of cracking patterns. Various behaviors of concrete under load are explored within the chapters of the book. These include cracking of ties, beams and in walls, and the simulation and evaluation of cracking, shrinkage and creep. The authors propose new engineering rules for crack width and space assessment of cracking patterns, and provide recommendations for measurement devices and protocols. Intended as a reference for design and civil engineers working on construction projects, as well as to aid further work in the research community, applied examples are provided at the end of each chapter in the form of expanded measurement methods, calculations and commentary on models. Francis Barre, Géodynamique et Structure. Jacky Mazars, University of Grenoble. Claude Rospars, IFSTTAR - EDF SEPTEN. Alain Sellier, LMDC, University of Toulouse.